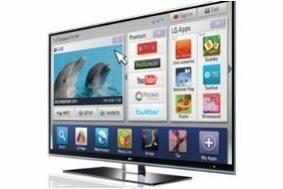 CES 2011: LG commits to passive 3D, says Smart TV will play a major part in boosting market share | What Hi-Fi? Passive 3D TV is a major part of that technology, and the company is also rolling out a range of Smart TVs, plus an add-on Smart TV Upgrader designed to bring web-enabled content to existing TVs. LG is calling its passive TV offering Cinema 3D TV, and claiming the technology delivers flicker-free 3D TV, and 'new heights of brightness and clarity'. The LW6500 range will be the first to use this latest technology, coupled with glasses weighing just 16g and costing less than $20 a pair, and also uses the company's 3D Light Boost, a thin film covering the screen to ensure images are shown at maximum brightness, and Nano LED lighting to give more accurate backlighting. Four pairs of the glasses will be supplied as standard with the TVs, which will come in 47-60in sizes, the company suggests will be one of the top performing models in the US market. The display technology enables the TVs to achieve THX certification, and the company also has plans for THX-certified plasma screens as part of a line-up of well over 100 new models. The TV line-up will be backed up by a full range of 3D-capable home cinema systems, which also include features such as HDD music storage, DLNA streaming and of course iPhone/iPod/iPad connectivity. Also new from LG is the world's largest Full LED backlit LCD TV, the 72in LZ9700. Like all the company's major line-ups for 2011, it will have Smart TV capability, providing a Home Dashboard for access to content from both global providers and local internet services, as well as a fast-growing range of TV apps. That Smart TV Upgrader box, the ST600, will offer the same facilities to those who don't want to buy a new TV, including DLNA streaming. Havis Kwon, president and CEO of LG's Home Entertainment Company, says that 'The market for Smart TVs is set to take off this year, and the ST600 offers a perfect entry point.